The “Resting Room” under construction. Last week I joined local Capital region media on a hard hat tour of the 17,000 foot Spa Mirbeau, a day resort that is being constructed at the Crossgates Mall in Albany. Brothers Jonathan T Dal Pos and Micheal Dal Pos, partners of Spa Mirabeau Albany guided us on a tour of the new spa, showing us the highlights that are under construction. The Aqua Terrace will have a sky light, a waterfall and a hot plunge pool. We were shown a rendering of the co-ed Resting Area, which will have a heated foot pool and fireplace, that should feel cozy in the winter. Le Bistro, the spa’s French bistro restaurant will be open to the public. The executive chef hasn’t been announced yet. The partners emphasized that the Spa Mirabeau will be a day resort, not so much a day spa. Guests can plan to spend the day there, take a spin class, work out at the gym, enjoy a massage, facial, and relax, and shop at Crossgates Mall. 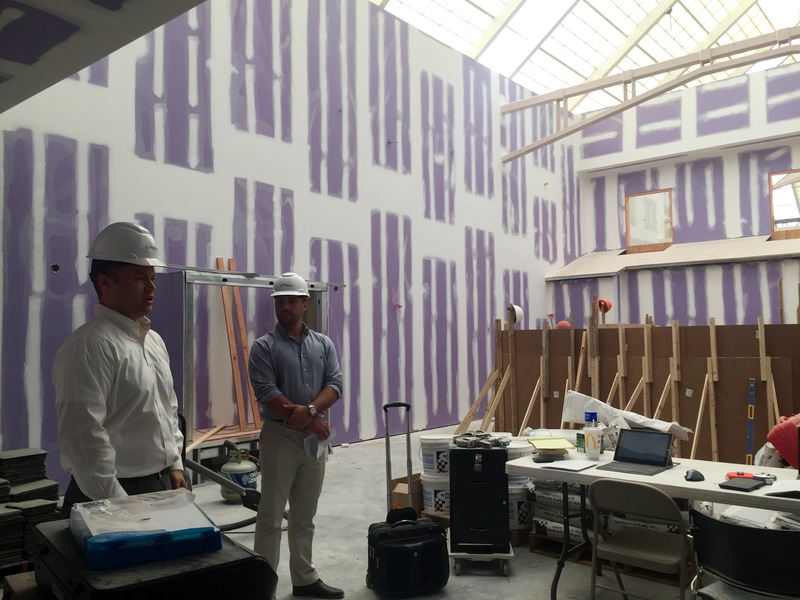 I enjoyed my first hard hat tour, which was hosted by Spa Mirbeau and Baker Public Relations. It’s hard to imagine that in less than a month, guests will be walking through these corridors in fluffy spa bath robes, but I’ve seen construction crews work their magic before. I’m looking forward to seeing their Grand Opening on November 15th, and experiencing the day resort soon after that, go to this web-site offer help for financing.